Nearly five years ago, the bilingual elementary school where I taught in East Oakland was subjected to an attempted US Immigration and Customs Enforcement (ICE) raid. Early in the school day, rumors among students and teachers began to fly—ICE agents had been seen parked several blocks away from the school. Everyone panicked, terrified that the agents would apprehend parents on their way to get their children at the end of the day. Office staff and parent volunteers called each family at home, instructing them to send only friends or relatives who had documents. The administration contacted the media. Soon, Mayor Ron Dellums and members of the Oakland police gathered outside to denounce ICE’s fear tactics. While politicians made statements outside, it was my job inside to calm down a class of first-graders who were all too aware of what an ICE raid meant. They knew their parents could be suddenly taken away or that they could be forced leave their homes and schools. As my students were playing outside during recess, a news helicopter began to circle above the playground. Many of my students came running back inside, panicked, in tears, shouting that la migra was coming in helicopters to get them. It was almost impossible to assuage that fear—to tell them that they were safe here and no one would take them away. Especially because I didn’t really know if that was true. The ICE agents never actually entered our school that day. Perhaps this was because intimidation had been their only goal, or perhaps the barrage of media attention had put them off. I later learned that several other schools in East Oakland and South Berkeley were subject to similar intimidation tactics that day—ICE agents parked nearby, watching and waiting for parents and students to leave the campus. At one East Oakland elementary school, ICE agents apprehended a woman in the school hallway before the start of classes; they led her away in front of her six-year-old daughter, other parents, and staff. Though such a dramatic brush with immigration enforcement didn’t reoccur during the two years that I worked at that school, each year parents asked many teachers, including me, to write letters on their behalf for immigration hearings. And each year I knew of at least one student whose mother or father had been deported. So when I set about compiling a list of children’s picture books that dealt with immigration issues, the memories of that attempted ICE raid and the deportation hearings were fresh in my mind. I found books that dealt with intergenerational ties and gaps, peer pressure and friendship, and, of course, language barriers and language learning. What caught my attention was the one theme that was missing. Though many of these books dealt with border crossings, few addressed issues of documentation and unequal access to citizenship in any meaningful way. Indeed, most skirted around the topic, leaving unexplained holes in their narratives of immigration. Others explicitly sent the message that citizenship in this country is equally attainable by all—a fact that many of my students know to be false. Especially in this current political climate, children’s book publishers rarely address issues such as undocumented immigration, unequal access to citizenship, deportation, the separation of families, and economic and racial discrimination—which they may see as too controversial for the children’s book market. Yet when I think about my students’ fears on the day that ICE came near our school, I know that, daily, many of our children have to deal with these issues. Whether we want them to or not, these powerful experiences and fears make their way into children’s lives. When we create immigration units or read picture books about immigration to our children, we have the luxury to avoid these issues. However, if we choose to do so, we risk marginalizing the students who don’t. Of course, we should never ask children to share personal information or disclose their immigration status, but we can safely discuss these topics through a literary lens. Indeed, if we want to help children better understand their world and realize that they are not alone in the problems they face, it is important to look at children’s books about immigration with a critical eye. Specifically, what kinds of messages about documentation and access to citizenship do these books impart to students? With this issue in mind, I studied and identified three broad categories of books according to the extent to which they explore or obscure these themes. Here are a few examples that illustrate each category. I hope that this provides a framework for critical analysis of children’s literature about immigration and is helpful to teachers planning curriculum or adding to their classroom libraries. The first category consists of books that ignore issues of undocumented migration or immigration and unequal access to citizenship, portraying a world in which US citizenship is equally (and often easily) available. 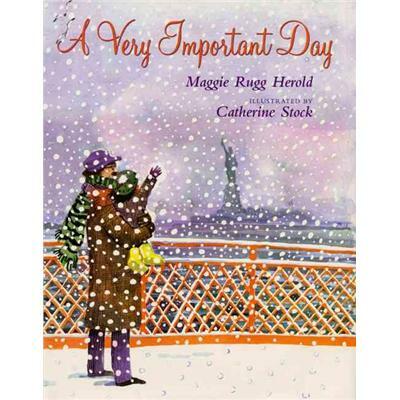 The most extreme example I encountered was Maggie Rugg Herold’s A Very Important Day (Morrow, 1995), in which families from the Philippines, Mexico, India, Russia, Greece, Vietnam, the Dominican Republic, China, Egypt, Ghana, Scotland, and El Salvador joyously celebrate as they make the trip downtown to the courthouse to receive their papers and to be granted citizenship. They happily swear loyalty to the United States of America and recite the Pledge of Allegiance, waving tiny American flags as they exit the courthouse. A Very Important Day implies that each family has had an equal opportunity to apply for citizenship. They have all followed the same equitable legal process described in the epilogue. For a child unfamiliar with the economic, linguistic, and political issues that make US citizenship more attainable for some than for others, this book creates a false sense of security—Look, our system is working well! For students and/or parents who do not have documents, A Very Important Day raises many questions that remain unanswered—Why can’t we just go down to the courthouse, recite the Pledge of Allegiance, and become citizens if everyone else can? Unless a teacher is willing to engage with these issues and discuss with students the story’s underlying assumptions, this book could do more harm than good. 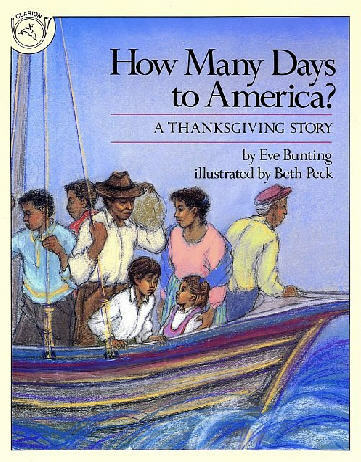 Eve Bunting’s How Many Days to America? A Thanksgiving Story (Clarion, 1988) portrays immigration and border crossings as difficult, but at the end the barriers suddenly disappear. This book tells the wrenching story of a family forced to leave an unnamed Latin American country, where they are fleeing from political oppression. They board a fishing boat to travel to the United States. Their journey is arduous—the motor breaks, the soldiers in their country shoot at them from the shore, their food and water run out, people become ill, and thieves take what little they have left. When they finally arrive at the shore of the US, soldiers give them food and water but do not let them land. “They will not take us,” the father comments sadly, but he doesn’t say why. How Many Days sets up a false expectation: No matter the struggle that it takes to get to the US, once here, you are safe and you are allowed to stay. Yet this is clearly not the case for many migrants and immigrants who have no documents. Indeed, many children recognize that, despite their families’ arduous journeys to this country, they still face the dangers of deportation, exploitation, and discrimination. Just as Bunting stays silent on the reasons why the soldiers initially refuse to allow the family to land, she all too swiftly conjures up a happy ending. Like A Very Important Day, How Many Days ignores the possibility that citizenship might not be easily attainable for all who set foot on US shores. While the books in the first category ignore issues of documentation and equitable access to citizenship, those in the second category hint at these themes but fail to explore them. They imply that the dangers exist, yet avoid putting the main characters at any real risk. Their message is that, although deportation and the separation of families occur, they usually happen to someone else. 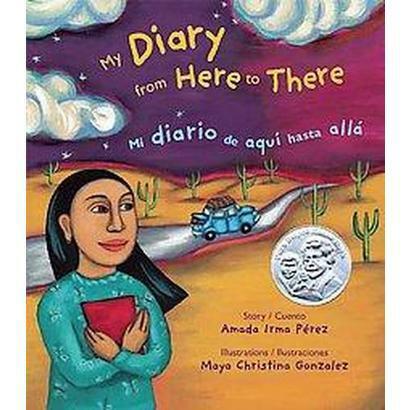 Amada Irma Pérez’ My Diary from Here to There / Mi diario de aquí hasta allá (Children’s Book Press / Lee & Low, 2002) is the fictional journal of a young girl who migrates to the US from Mexico. Her father is a US citizen, but the family must wait near the border while he secures their green cards. The young narrator expresses sadness at how she cannot see her father and fears that he will not be able to obtain green cards for the rest of the family. Yet they wait patiently, the green cards finally arrive, and the family is able to cross the border and be reunited. On the bus into the US, the police arrest a woman without papers. This incident is mentioned but not discussed, leaving children to question why only some migrants or immigrants have easy access to documents. In her dream, Esmeralda rescues her mother. When the soldiers begin chasing her, she makes green vines and bushes of cilantro grow up and erase that border, declaring that the world should be sin fronteras—borderless. However, when Esmeralda wakes up, she discovers that she had been dreaming and that her mother is safely back home. 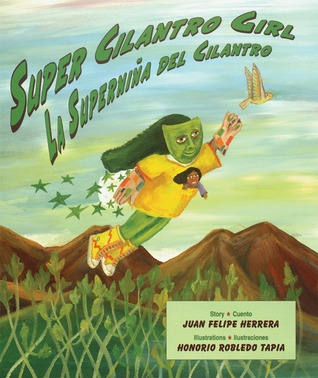 Super Cilantro Girl hints at the terror that children experience at the prospect of their families’ being split apart, but it does not put the characters in any real danger. Esmeralda’s mother is a citizen and, therefore, does not risk being separated from her family. In the foreword, Herrera expresses concern about families kept apart by borders and shares his wish that some superhero could abolish such borders and bring those families back together. However, making Esmeralda’s mother a citizen in no danger of actually being barred from returning home sends the message that family separation, deportation, and detention centers are all part of a dream from which you can wake up. These real dangers exist only in the lives of others. The final category includes the handful of books I found that deal head-on with issues of documentation and unequal access to citizenship. 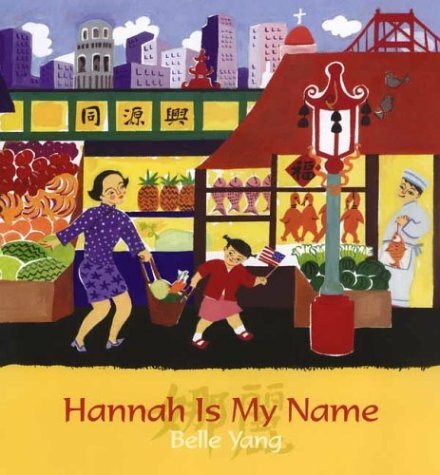 In Belle Yang’s Hannah Is My Name (Candlewick, 2004), a family immigrates to San Francisco from Taiwan. Though they apply for green cards, they wait more than a year for a response from the government. During this time, the young narrator’s parents must work illegally to make ends meet. When the boss of a clothing factory realizes that Hannah’s mother doesn’t have papers, he fires her; and Hannah’s father, who works in a hotel, is constantly on the watch for immigration agents. One of Hannah’s friends, a child from Hong Kong, is deported because her father has been discovered working at a Chinese restaurant before his family has received their green cards. And one day, while Hannah is visiting her father’s work, she and her father are forced to flee from an immigration raid. From then on, her father must work at night. The story concludes happily—the family finally receives the green cards and is allowed to stay. In the process, however, the author exposes several key issues, including the seemingly arbitrary nature of the immigration process and the fact that many families must work illegally to survive while applying for documents. How can that be—how can anyone be illegal? She is Mixteco, an ancient tribe that was here before the Spanish, before the blue-eyed, even before this government that now calls her “illegal.” How can a girl called América not belong in America? Although there are many children’s books that deal with the experiences of Asian immigrants and Latin American (specifically Mexican) migrants and immigrants, few tell the stories of immigrants from other places, such as Africa or the Middle East. I urge teachers to seek out books that represent these populations, especially books that tackle the difficult issues surrounding immigration status and citizenship. If we want migrant and immigrant students to know that they are not the only ones who face struggles in the US—that many share similar experiences because of the existence of larger systemic injustices—this is especially important. Although I’ve reflected on these books because my class includes migrant and immigrant students—many of whose families do not have documents—I believe that it’s just as important for all teachers to look critically at books such as these. In all probability, children who do not confront these issues in their daily lives are the least likely to question the portrayals of immigration in the books they read. Finally, I want to emphasize that none of these books—regardless of whether they confront or evade the topics of documentation and inequitable access to citizenship—stands alone. Before adding titles to the classroom library for independent reading, read these books aloud and discuss them as a group. Treat these sensitive issues with care, give them the attention they deserve, and deal with them in a safe environment. If we want to develop students who think critically about their own lives and about the world around them, we, as teachers, must involve ourselves in guiding children as they discover, explore, and analyze. Thinking critically about the books ourselves is the first step in facilitating thoughtful dialogue among our students. Another version of this essay first appeared in Rethinking Schools (www.rethinkingschools.org). We thank Rethinking Schools for permission.